Extend default Magento Tier Price function by allowing admins to define tier prices as a percentage and amount. 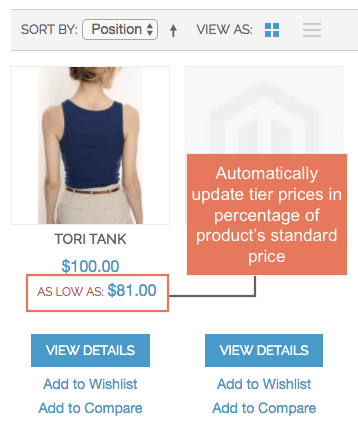 Magento Percentage Tier Price Extension updates the tier prices according to the percentages you have inputted when you update the price of your product. This extension will effectively reduce your time-consuming and optimize your sale activity. Enable to set Magento tier price for each quantity range in both fixed amount or in percentage based on product price or customer group price. To be clear, let’s take the following example. While the standard price is $60, the price for wholesale customers is $55. In tier price box, for wholesale group, Magento admin set the tier price for them based on percentage of their group price ($55) so that whenever the quantity of products of a wholesale order is 10 or above, the wholesale customer will get a discount of 5% based on the wholesale price ($45). Automatically calculated and displayed tier price on frontend in case of setting it in percentage. Why Magento Percentage Tier Price is your must have extension? Although the tier price is equipped in default Magento, it is allowed to be set in a fixed amount so whenever there is a change in product price, admins find it very troublesome to make changes. Normally, they have to manually input the price change. With Magento Percentage Tier Price, this situation will no longer be a concern! Once Magento Percentage Tier Price Extension is installed in your store, whenever there is an update in the price, the tier price will be automatically changed to match with the price update. To understand how Magento Percentage Tier Price extension works, let’s take a look at this simple example. If you want to constantly give customers a 15% discount for ordering more than a specific amount of products, it’s really difficult to constantly update this tier price every time the product price changes. Now, with Magento Percentage Tier Price, you can set the tier price to 10% and it will automatically update for you! Magento Percentage Tier Price extension also supports discount in percentage for group price which sets promotional prices for different customer groups at the product level. Therefore, store owners have more choices to differentiate their price strategies which for sure makes your online store more competitive on the market. This extension works as described and I would recommend it to anyone who would like to add tier prices on their website. Customer support is excellent, I have no objections whatsoever! "This extension does perfectly what we need for my store and we don’t have any problem into running it. this is the first time I bought extension from BSS and I received great support from your company. Thanks BSS for free installation and help. " This extension perfectly fits my site and the price is so reasonable. Everything goes on well and smoothy. Installation free from BSS. Thanks! I'm very pleased with this extension as it can automatically update price tiers as long as you manually update product prices.